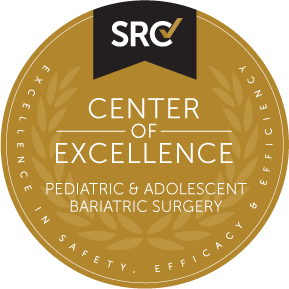 In partnership with key opinion leaders and industry professionals, SRC developed the Center of Excellence in Pediatric and Adolescent Bariatric Surgery (PACE) program. The PACE program identifies surgeons, facilities and patient care teams that provide excellent pediatric and adolescent bariatric surgical care and are dedicated to continuously improving healthcare quality and patient safety to their specific patient population. The applicant demonstrates a commitment to excellence in the care and management of overweight, obese and morbidly obese pediatric and adolescent surgical patients and their families “PACE Patients”. The applicant is committed to providing PACE Patients with a medically-supervised weight loss management program that includes or is capable of supporting bariatric surgery as an intensive treatment option. This commitment includes credentialing and privileging guidelines for bariatric surgery that are separate from general surgery guidelines. Each applicant surgeon has performed at least 125 qualifying bariatric surgery procedures in his or her lifetime, with at least 100 cases performed in the preceding 12 months. Each applicant facility and surgeon meets surgical outcomes benchmarks for mortalities, complications, readmissions and reoperations. If a facility or surgeon does not meet one or more of the required outcomes benchmarks, they may be eligible for a conditional one-year designation approval. The applicant maintains two program Co-Directors for the program, a Pediatrician Medical Director and a Surgical Director, that both have program oversight. At least one of the directors must have significant expertise in the care of PACE Patients and at least one must participate in the relevant decision-making administrative meetings of the facility. The Co-Directors must have been officially appointed through the facility’s standard administrative process. The Surgical Director must be designated, or in the process of becoming designated, as a Center and/or Surgeon of Excellence in Metabolic and Bariatric Surgery. The Pediatrician Medical Director must spend a significant portion of their efforts in caring for overweight, obese and morbidly obese pediatric and adolescent patients and their families. They should be a Board Certified Pediatrician with documented experience with medically-assisted weight loss programs. The Co-Directors hold interdisciplinary team meetings at least quarterly to ensure that decisions related to bariatric surgery are addressed in a comprehensive manner. The Directors should be primarily responsible for coordinating the interdisciplinary services and care of PACE Patients. The applicant facility includes a full complement of the various consultative services required for the care of overweight, obese and morbidly obese pediatric or adolescent surgical patients including the immediate availability of critical care services in addition to an age-appropriate intensive care unit. Anesthesiologist or Certified Registered Nurse Anesthetist (CRNA) who supervises anesthesia delivery on all bariatric surgery patients and is physically present until the patient is discharged from the Following PACU discharge, the anesthesiologist or CRNA is available on-site within 30 minutes if needed. The applicant has a full line of equipment and surgical instruments to provide appropriate perioperative care for PACE Patients, including operating room tables, radiologic capabilities, surgical instruments, beds, floor-mounted or floor-supported toilets, furniture, wheelchairs, blood pressure cuffs and examination gowns. Personnel are trained in the safe operation of this equipment and capable of moving patients without injury to the patient or themselves. The applicant surgeon spends a significant portion of his or her efforts in the field of bariatric surgery and completes continuing medical education. The applicant surgeon is board-certified or an active candidate for board certification as a general surgeon by the highest certifying authority available. The applicant surgeon has privileges as both a bariatric and general surgeon at the applicant facility. The Pediatrician Program Director must have qualified coverage and support in caring for overweight, obese or morbidly obese pediatric and adolescent patients. The applicant facility has policies in place that require all bariatric surgeons to have qualified call coverage, and the applicant surgeon certifies that each covering surgeon is capable of identifying and treating bariatric surgery complications. Each covering surgeon is board-certified or an active candidate for board certification as a general surgeon by the highest certifying authority available. All covering surgeons must be available on-site within 30 minutes. Applicant and covering surgeons who are not board-certified or an active candidate may be eligible for a board certification waiver based on experience, demonstration of good standing, licensing and fellowship. The first three pathways will be deemed satisfied if the facility has accreditation from The Joint Commission (formerly known as JCAHO). The applicant surgeon performs each bariatric surgery procedure in a standardized manner as allowed by variations in operative circumstances. The applicant has nurses and/or physician extenders who provide education and care to PACE Patients as well as a bariatric program coordinator who supervise program development, patient and staff education, interdisciplinary team meetings, and ongoing program compliance. The applicant maintains an interdisciplinary Pediatric and Adolescent Bariatric Committee. This committee will have regular discussions and review each patient in the program. Surgical candidates will be given special consideration in consultation with appropriate surgical staff. At a minimum, programs should document the regular involvement of the program’s Pediatric Medical Director, Surgical Director, bariatric surgeon, physician extender, program coordinator, psychiatrist/psychologist, physical activity specialist and registered dietician. This team should also be in regular contact with the patient’s own pediatrician or primary care physician, if the patient has one, beyond the scope of the PACE program. The applicant provides organized and supervised support groups for all patients and their families who may undergo or have undergone bariatric surgery. Applicant must collect prospective outcomes data on all patients who undergo a qualifying surgical procedure in SRC’s Database (or a similar qualifying database) in a manner consistent with applicable patient privacy and confidentiality regulations. This de-identified data must be available to SRC for initial and renewal site inspections or upon request. Site Inspection fee covers a one-day inspection with one site inspector. If the inspection requires more than one day and/or more than one inspector, additional charges will be incurred. For site inspections outside of the United States, surcharges will apply for airfare and other travel expenses. The applicant facility is responsible for arranging and paying for the site inspector’s hotel, ground transportation and, if needed, an interpreter/translator. These items are not included in the standard site inspection fee.